Little Weirdos: Mini figures and other monster toys: Seres Míticos: Mythology monster minis from Mexico! 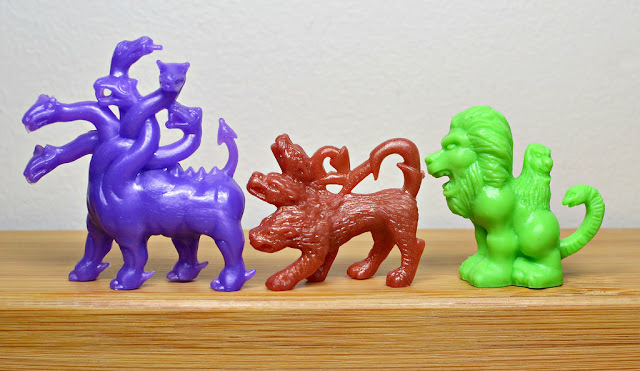 Seres Míticos: Mythology monster minis from Mexico! 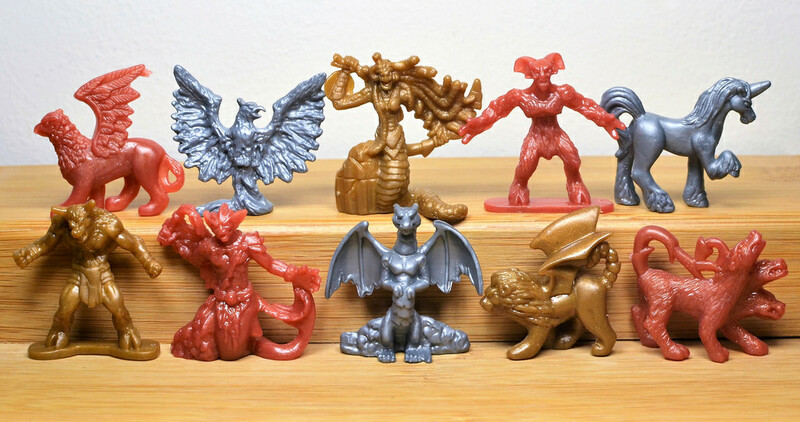 I recently became aware of a new set of monster mini figures called Seres Míticos, and immediately knew I needed to have them. The only problem is that they were only released in Mexico. For that reason it took a bit of extra effort, but I finally got my mitts on a set to add to the Little Weirdos horde/hoard. Seres Míticos figures were released at the end of 2017 as giveaway premiums included in packages of Mexican snack cakes called Gansitos / Gansi Premio. These cakes are produced by a company called Marinela. There are 10 different sculpts to collect, featuring creatures from well known myths and legends (especially Greek mythology). 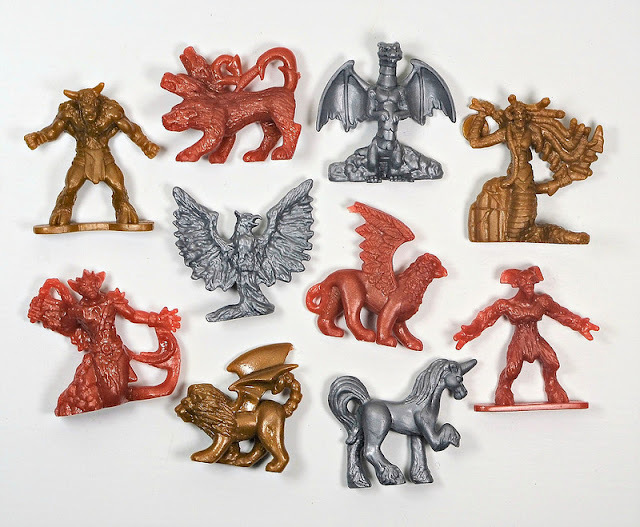 They include Gryfo (Griffin), Triton, Cerberus, Manticora (Manticore), Minotauro (Minotaur), Fauno (Faun), Fenix (Phoenix), Unicornio (Unicorn), Medusa, and Dragon. Each figure comes in three different colors: bronze, silver and gold. They are made of hard plastic and measure about 1.5" tall. One figure is included per pack of Gansi Premio cakes. 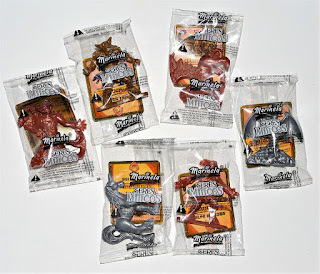 They come individually wrapped along with a small character card with artwork that depicts one of the 10 monsters (for some reason the cards don't necessarily match up to the figures they're packed with). Seres Míticos are some of the best toy premiums I've seen in a long time. 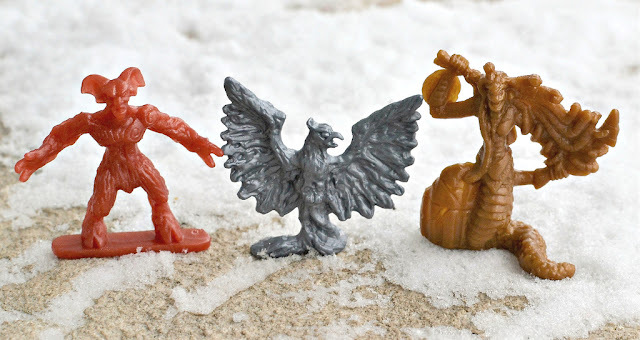 They remind me of the glory days of toy giveaways and monochromatic mini figures, particularly Monster in My Pocket (if fact, I'd be surprised if they weren't inspired by MIMP). They also remind me an awful lot of the obscure but amazing Horrors N Heroes set, in both the style of the sculpts and metallic colors used. I also love that they include creatures that haven't been included in many (if any) other sets, such as Phoenix and Faun. It would be better if Minotaur and Faun didn't have bases. It seems like they still could have made them to stand without them. The only other thing I'd change would be to make them a bit larger. Seres Míticos were a great surprise. I didn't know anything about them before I stumbled onto a photo of them that was posted on Facebook, and it was the kind of discovery that continues to fuel my collecting obsession. U.S. companies should take a hint from Mexico in this case, because toy premiums this great are pretty much nonexistent here these days. I hope they've been a big hit in Mexico so that Marinela releases a second series! What do you think? Do you plan on hunting down a set of Seres Míticos? Great review of awesome set. Can anyone give confirmation or news of the reception these had in Mexico? Maybe the original snack cake company could be contacted especially if they have a PR department? Thanks for response. Somebody involved in their production should do something to have a release in USA. They could talk to an indie company or big chain like WalTargCstco and have them be an "exclusive" or even dollar section release. Would probably do really well state-side. I disagree with you about kids collecting figures though maybe I over estimate the issue, but kids (boys) have liked skylanders and minecraft figs a lot, D&D is making a resurgence with stranger things, there might be a good niche ripe for figures like these. I love them, they are fantastic! A bit serious and very detailed sculpt. Great post. Too bad the figures are under sized, but they still have their charm. I knew about them too late when I was looking for minis to play D&D with and a friend told me about this line, but i really dont like gansito anyways so buying snacks only for the price would be a waste. Do you happen to know about other mexican figures like Olorocos/Olocoons or those rubber bootlegs that are still being manufactured to this day? Hi. My Name is mattia And i am from italy. Your site is simply Wonderfull. I have never found a collection like your but i am also a little monsters collector like You since i was a child (Now i am 34) And i have 600 pieces. If You are intersted To See The photos and/or you are interested in a barter write me To dioneeit@yahoo.it. Hope To write u Soon And compliments again!